Federal regulations require each state to establish one set of child support guidelines that courts and hearing officers should apply as a rebuttal presumption in any judicial or administrative proceeding for the award of child support. Statewide guidelines encourage consistency in child support award amounts among similarly situated parties and provide predictable amounts to parents. Nonetheless, states have discretion in the guidelines models and the economic basis of their child support formulas and schedules. This article examines whether differences in state guidelines award amounts can be attributed to differences in guidelines models used by states. It also considers differences in the underlying economic data used by states on the costs of raising children. 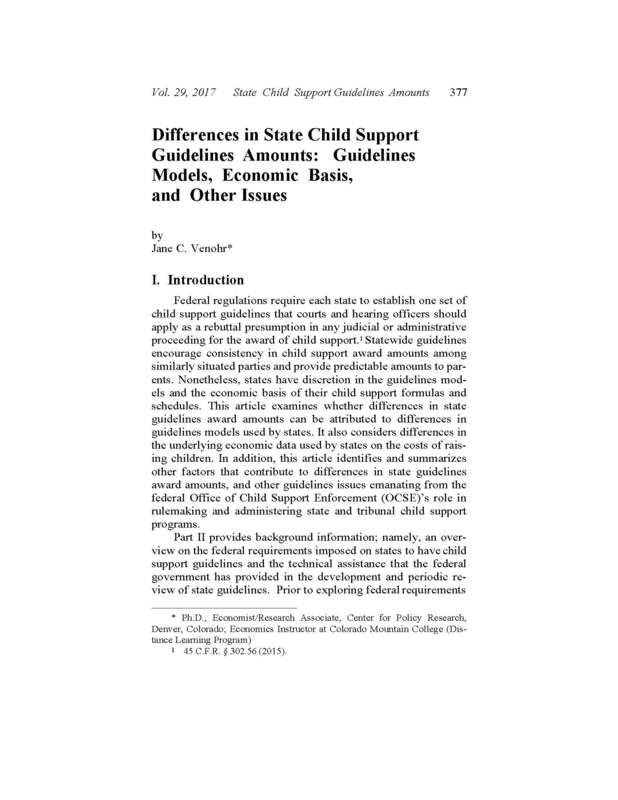 In addition, this article identifies and summarizes other factors that contribute to differences in state guidelines award amounts, and other guidelines issues emanating from the federal Office of Child Support Enforcement (OCSE)’s role in rule making and administering state and tribunal child support programs. Part II provides background information; namely, an overview on the federal requirements imposed on states to have child support guidelines and the technical assistance that the federal government has provided in the development and periodic review of state guidelines. Prior to exploring federal requirements and federal assistance, Part II explores the differences in the volume and characteristics of child support orders established or en- forced under state child support programs and those established privately. (This is important because the federal agency overseeing state child support programs is the same agency that crafts federal regulations for statewide guidelines applicable to both case types.) Section III identifies and describes the three types of guidelines models currently used by states. Section IV summarizes the economic evidence on child-rearing expenditures underlying state guidelines. It also identifies variations among states in how they use the economic evidence and other considerations made by states in the development or revision of guidelines’ schedules and formulas. Section V compares state guidelines amounts. It first uses a low-income scenario, then uses a high- income scenario. Section V also examines whether state guidelines amounts vary by guidelines models and a state’s cost of living. Section VI provides a summary and conclusion.